Y'all it's pretty much here. 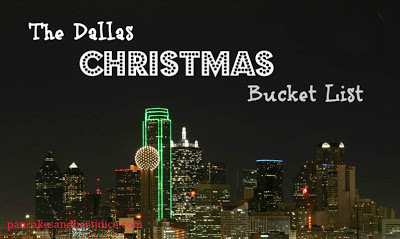 The time of year when all of my weekend energy goes into ﻿conquering all that is Christmastime in Dallas. There is so much cool stuff to do here during the holidays, I start looking forward to it as soon as the wreched tax free weekend is over! City Lights Downtown is the night that Downtown Dallas lights itself up for the holidays. This is what kicks off the holidays for me, since it is usually right before Thanksgiving (it's this Saturday, November 17, this year!). One of my friends from high school has a flat with a terrace in the Mertancile Building that overlooks Neiman Marcus and Main Street gardens so we always have an awesome view of Santa repelling or zip lining into his chosen location. There's a parade and it's a lot of great energy in downtown, which is always a treat! This is also when Neiman Marcus pulls back the curtain on their holiday windows. I've always loved the downtown Neiman Marcus' holiday tree and window displays, and they totally took it up a notch when they added the crawl through tubing for children a few years ago. If you don't know what I'm talking about, you need to go check this out. Kids, when I was your age, this parade was the Neiman Marcus Adolphus holiday parade. It's a really fun, Christmas themed parade geared towards children that now is a fundraiser for Children's Medical Center - which I think is even more awesome! My favorite part of the parade growing up was the Adolphus chefs going out on the balcony in their perky, white chef hats to watch the floats go by. Dallas is a great town for a Christmas parade because the weather will likely be cool enough for a festive scarf but above freezing! If you have not come to know, I'm kind of old fashioned and don't, like, love a lot of change. So when the new (to me) Gaylord Hotel in Grapevine started doing their ice sculptures I avoided it for a while. Then they did the Charlie Brown story and I had to go. It was awesome! Everyone should do this at least once, if not every year. This year the theme is Madagascar so we are going to be the coolest kids on the block when we take our family friend who is nine this weekend. If you want to fully experience the Gaylord while you're there, they host brunches and activities to go with the show that you can find on their website. I am the kind of traveler that loves to see the "World's Largest _____" or the "Biggest ____ in America," so I take special recognition in the fact that Dallas boasts the largest indoor Christmas tree in America, right in the center of the Galleria's indoor skate rink. This is so fun to see when you're out Christmas shopping. Misletoes is their ice skating Santa that does back flips and has fireworks shoot out of his skates (obviously). With the way this mall is set up you can look up what time he will be making his appearances and catch the show from the railings around the rink, no matter what floor you're shopping on! If Dorothy Hamill comes back for an appearance this year, you know I will be front row. If there is one thing that is completely non-negotiable when it comes to Christmas, it is seeing Scrooge at Northpark. Don't get me presents, forget to make a ham, whatever. Just make sure I get to see this puppet make snarky comments to kids and their parents. My grandfather loved taking us to this show when we were growing up and the years that he was Scrooge's chosen victim for skipping work and indulging in consumerism were the best Christmases ever. I go every year. I sit on the floor with the kids. I'm pretty sure I terrify the badass puppeteer that's been doing this every day from Thanksgiving through Christmas Eve for decades. It is awesome. While you're at Northpark, the trains are very cool and benefit Ronald McDonald House and this is also where Dallas' "real" Santa lives, or as Scrooge would call him, "the funny fat man in the red suit." That's right, I have the entire show memorized. No shame. I think there is something stunning about golden white lights that wrap all the way up the stems of a tree. If you think so too, Highland Park Village is your mecca. If you dine at one of their choice restaurants (Mi Cocina is my fave but I've heard excellent things about Bistro 31), you'll be able to gaze out at the beauty throughout your meal, thanks to the floor to ceiling windows that most of the eateries in America's first shopping center boast. If you want to take the night to the next level, you can rent a carriage from here to take you around the neighborhood to see their Christmas lights. Christmas lights in Dallas are amazing. We hit the top three neighborhoods (Highland Park, Deerfield and Farmer's Branch) multiple times a year. Our family tradition is to go to Quick Trip convenience store and everyone gets to pick out a bag of chips to snack on while light hunting. The link above is to my post from last year that gives the details on each neighborhood and addresses for the best houses. You don't want to miss it! Some people will say the Nutcracker is the way to go as far as live performances, but if I'm going to ask my spouse to shell out money for theater tickets, I prefer he also stay awake through the performance. The annual run of A Christmas Carol is traditional but lively. I love the message of this play. The only room for improvement I can see would be if they added The Great Gonzo as narrator, like my favorite move version. Tuba Christmas always takes place on Christmas Eve (except when it doesn't, which was the case last year - some weird rule about weekends or "i before e except after c"). Your favorite Christmas carols are blasted through downtown from a merry collection of Tubas and Euphoniums. This is a national phenomenon, with the Dallas event always taking place in Thanksgiving Square. Markus went to college on a tuba scholarship and played in Tuba Christmas the first year we moved here. We've been attendees ever since! If you are smart and call well in advance, you can walk across the street to Neiman Marcus and enjoy their special holiday brunch at the Zodiac after the show. There are mini donuts. Of course, nothing really beats being home and simply enjoying the company of your family during the holidays (except Scrooge, he seriously is the best). Many of these activities are free and I hope if you try them they bring as many special memories to you as they have to me over the years! What's the one thing you must do for it to really be Christmas? Thank you so much for this list! Since I'm brand new to Dallas and super gay for all things Christmas, I will utilize this to the point where my friends might be annoyed. Lilly... what a great post! My Mister works in Dallas in the hospitality industry and I have not heard about any of these exciting things. Thank you so much for sharing and would love to get together with you over the Christmas holidays for lunch. Would love for my girls to meet you! Such a great post, you got me all excited about Christmas now. Have never been to the Gaylord ICE so I'm excited to check it out. Thanks! I would add one thing to this list and it is free! The Community Nativity in Carrollton. It is a cooperative effort across many Christian faith-based denominations from Carrollton, Coppell and beyond. The Nativity will appeal to your eyes and your ears! Hundreds of nativities from around the globe are gracefully displayed, along with complimentary art, statuary and even a live nativity! Additionally, the Nativity includes a comprehensive choral and instrumental performance schedule, with sacred seasonal repertoires brought to you by a variety of entertaining and accomplished talent from around the Metroplex. This is amazing! 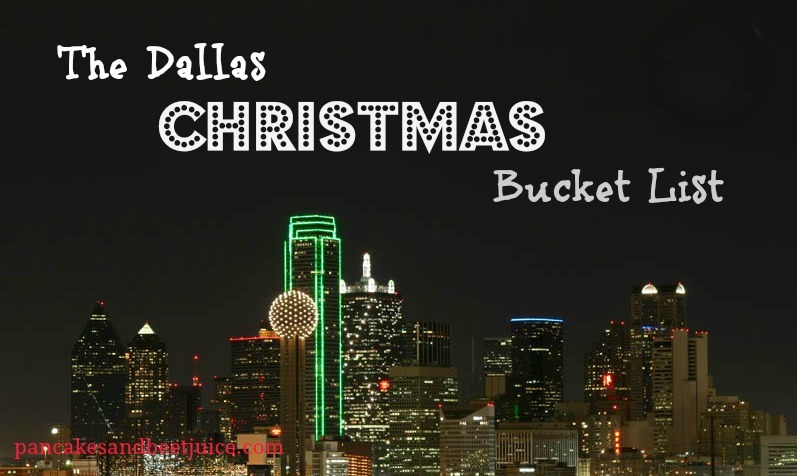 I just moved to the Dallas area on Monday and have been looking for some fun things to do during the holiday season. Thanks so much! I've always wanted to see the Gaylord Ice thing. Maybe someday. For me it's not Christmas until I watch It's a Wonderful Life. I can usually find a small theater doing a screening somewhere in the city. The Gaylord ICE is offering 50% off ticket prices until 11/20/12. If you enter the promo code ICEFB when purchasing tickets online you'll get the discount! Tried the code, didn't work :-(. It took the code but didnt give me 50% off? Have done most of these things and they are wonderful!!! I would also add Grapevine to this list with there North Pole Express train, and ice slides. It's a Winter Wonderland!!!! Thanks again for this wonderful list. Deerfield is part of our Christmas tradition, we pack up the SUV, pick up some fast food & drive around admiring the lights. My girls LOVE it. Wow that is some bucket list!! Sounds like Dallas has it going on! Funny but today I decided to search for a friend I went to college with in NYC (she is from Cali) and through sleuthing I found her in Texas!! You should add Prairie Light's at Joe Pool! Awesome list! I'd add the Arboretum -- this year they have Nativities from all over the world and the bonus of an extended installation of stunning Dale Chihuly glass. We took a picnic and some wine late afternoon, enjoyed dusk and got to see everything in daylight and at night. Incredible! Great list!! DALLAS Wine and Chocolate Christmas light tour is also fantastic! Hop on the trolley, view Christmas lights in Highland Park, make three or four stops for wine and chocolates, and view more Christmas lights. Super fun! !